The University has seen an increase in Title IX reports involving student complaints about sexual violence, according to the Title IX office. Title IX complaints consist of cases involving sexual assault, stalking/harassment, sexual misconduct, relationship violence and other categories. LaToya Hill, UT’s Title IX coordinator, said more students are aware of their reporting options on campus when they experience interpersonal violence compared to previous years. As of April 7, Smith said 183 cases have been reported for 2015-2016 so far, compared to 139 cases for 2014-2015 and 100 for 2013-2014. The University may see more than 200 cases reported to the Title IX investigation unit by the end of the year, she said. Smith said students may not report interpersonal violence because they fear retaliation, don’t think they will be believed and believe what happened to them is their fault. Mia Goldstein, Plan II and radio-television-film senior and member of Voices Against Violence, said more survivors are filing reports because the campus climate around sexual assault has changed for the better. Smith said she was glad to see more reports come in, but said more work needs to be done to make sure students know where to turn when experiencing interpersonal violence. The Title IX office hopes to launch a “more robust” website informing students about their resources and reporting options, she said. “The website will have more information, more handouts, more resources that talk about the general process, resources about how to help a survivor,” Smith said. 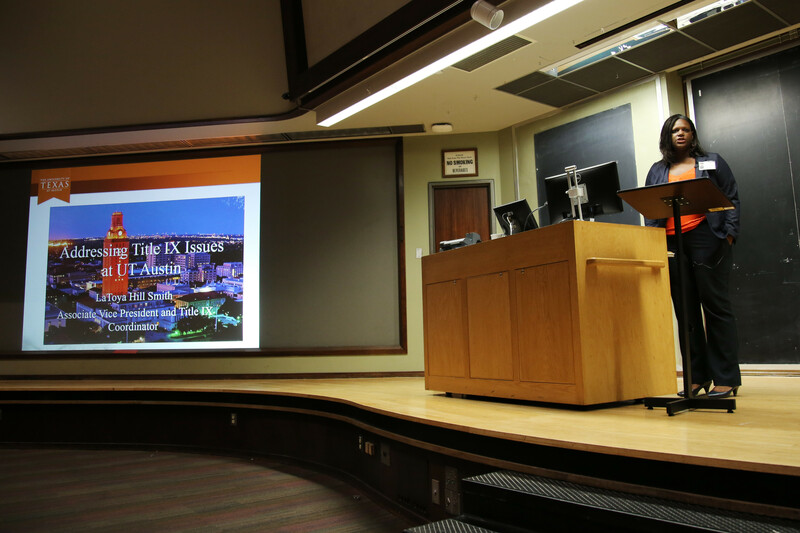 Some of the Title IX reports involving students come from faculty and staff, who are generally required by UT’s policies to report instances of interpersonal violence when students disclose a sufficient amount of detail to them. Smith said she is exploring more confidential options that don’t require mandatory reports so students feel more comfortable exploring the process of reporting to the University. Linda Serna, women’s and gender studies senior and student coordinator at VAV, said VAV is working on establishing a peer advocacy program to inform students about their reporting options while allowing the survivors to decide whether to report.